Pudong is a district of Shanghai located east of the Huangpu River across from the historic city center of Shanghai in Puxi. The name refers to its historic position as "The East Bank" of the Huangpu River, which flows through central Shanghai, although it is now administered as the Pudong New Area, a state-level new area which extends all the way to the East China Sea. "East of the Pu [River]"
The traditional area of Pudong is now home to the Lujiazui Finance and Trade Zone and the Shanghai Stock Exchange and many of Shanghai's best-known buildings, such as the Oriental Pearl Tower, the Jin Mao Tower, the Shanghai World Financial Center, and the Shanghai Tower. These modern skyscrapers directly face Puxi's historic Bund, a remnant of former foreign concessions in China. The rest of the new area includes the Port of Shanghai, the Shanghai Expo and Century Park, Zhangjiang Hi-Tech Park, Shanghai Pudong International Airport, the Jiuduansha Wetland Nature Reserve, and the Shanghai Disney Resort. In 1993, the Chinese government set up a Special Economic Zone in Chuansha, creating the Pudong New Area. The western tip of the Pudong district was designated as the Lujiazui Finance and Trade Zone and has become a financial hub of modern China. Several landmark buildings were constructed, including the Oriental Pearl Tower, the Jin Mao Building, and the supertall Shanghai World Financial Center 494 m (1,621 ft) and Shanghai Tower (projected to reach 565.6 m or 1,856 ft). These buildings—all along Century Avenue and visible from the historic Bund—now form the most common skyline of Shanghai. On May 6, 2009, it was disclosed that the State Council had approved the proposal to merge Nanhui District with Pudong and comprise the majority of eastern Shanghai. In 2010, Pudong was host to the main venues of the Shanghai Expo, whose grounds now form a public park. Pudong New Area consist of the original Pudong County (northeastern portion of Shanghai County), Chuansha County, and Nanhui County. Districts of the direct-controlled municipality of Shanghai are administratively on the same level as prefecture-level cities. However, the government of Pudong has a status equivalent to that of a sub-provincial city, which is a half-level above a prefecture-level city. 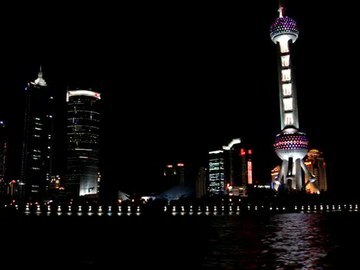 This is due to Pudong's size and importance as the financial hub of China. The Pudong Communist Party Secretary is the top office of the district, followed by the district governor of Pudong. The Pudong party chief is customarily also a member of the Shanghai Party Standing Committee. On April 27, 2015, People's Government of Pudong New Area is working with China (Shanghai) Pilot Free-Trade Zone Administrative Committee. Pudong literally means "East Bank". Pudong is bounded by the Huangpu River in the west and the East China Sea in the east. Pudong is distinguished from Puxi ("West Bank"), the older part of Shanghai. It has an area of 1,210.4 square kilometres (467.3 sq mi) and according to the 2010 Census, a population of 5,044,430 inhabitants, 1.9 million more than in 2000. Currently, at least 2.1 million of residents of Pudong are newcomers from other provinces or cities in China. Pudong is the most populous district in Shanghai. According to the 2010 Census, it has 5,044,430 people in 1,814,802 families, around 1/4 of Shanghai's total population, an explosive growth since the last census thanks to immigrants. Pudong's resident population growth is well above national average because it is a popular immigration destination. The 2010 census shows a 58.26% increase in the last decade, or an annual pace of 4.7%. In particular, the district saw am immigration growth of 189.5%, or an annual pace of 11.22%. Excluding immigrants, the birth rate is 0.806% while the death rate is 0.729, resulting a net growth of 0.077%. The total fertility rate is 1.03, well below the replacement level. The district actually has a negative registered household population growth if immigrants are excluded, thus the growth is purely driven by immigration. The 2010 Census shows a population density of 3,909/km2. About 3/4 of the population live in the northern part and part of city center called "Northern Territory". 1/4 live in the "Southern Territory" that was the Nanhui District. The Northern Territory has a 6,667 population density, while the Southern Territory has 1,732/km2. Suburbs saw a greater increase in population during 2000-2010 with the help of the city's suburb expansion policy. Some counties in the traditional city center saw a population decrease. * – Liuzao town merged into Chuanshaxin town. ** – Luchaogang town and Shengang Subdistrict merged and form Nanhui Xincheng town. With the Nanhui District merger in May 2009, the size of Pudong's economy grew. The district's 2015 gross domestic product amounts to an estimated 789.8 billion RMB (~US$113.5 billion), with services comprising 70% of economic output. Its GDP per capita in terms of purchasing power parity is approximately $50,783. The area is divided into four distinct economic districts. Apart from Lujiazui Trade and Finance Zone, there is Waigaoqiao Free Trade Zone, the largest free trade zone in mainland China covering approximately 10 square kilometres (3.9 sq mi) in north-east Pudong. The Jinqiao Export Processing Zone is another major industrial area in Pudong covering 19 square kilometres (7.3 sq mi) Zhangjiang Hi-Tech Park is a special area for technology-oriented businesses. The Pudong area continues to experience rapid development, especially in the commercial sector, with 1.3 million square meters of prime office space reaching completion in 2008, more than the previous two years combined. Pudong has also attracted considerable fixed asset and real estate investment, reporting 87.268 billion RMB in fixed asset investment and 27.997 billion RMB in real estate investment in 2008. The newest Disney resort, with a Disneyland included, is located in Pudong, which is open to tourists in June 2016. Bao Steel has its head office in the Bao Steel Tower (simplified Chinese: 宝钢大厦; traditional Chinese: 寶鋼大廈; pinyin: Bǎogāng Dàshà) in Pudong. Comac has its head office in Pudong. The headquarters of Yangtze River Express, a cargo airline, are in the Pufa Tower (浦发大厦; 浦发大廈; Pǔfā Dàshà) in Pudong. Hang Seng Bank has its mainland offices in the Hang Seng Bank Tower in Pudong. Kroll has an office in the Hang Seng Bank Tower. Google has its Shanghai offices in the Shanghai World Financial Center. The Shanghai Pudong International Airport opened its doors in 1999, shortening the travel time for visitors. In the same year, Line 2 of the Shanghai Metro commenced services. An extension brought the line further east, where it serves the airport. Other lines, namely Lines 4, 6, 7, 8, 9, 11, 12, 13 and 16 also have sections that serve parts of Pudong. A magnetic levitation train began operating in 2004, moving passengers between the airport and Longyang Road Metro station. Pudong is connected to Puxi by several tunnels and four major bridges. The first of these bridges were the Nanpu Bridge (1991) and the Yangpu Bridge (1993). The Xupu Bridge opened in 1996. The latest of these is Lupu Bridge, which is the world's second longest arch bridge and was completed in 2002. Currently there are five tunnels that link the two sides, Dapu Rd. Tunnel, the first tunnel across the Huangpu River, Yan'an Rd. Tunnel, running east-west, and Dalian Rd. Tunnel, running north-south, Fuxing Rd. Tunnel, complementing the Yan'an Rd. Tunnel, Waihuan Tunnel, one part of Shanghai Outer Ring Express. Two new tunnels linking Lujiazui to Puxi are under construction. Roads in Pudong have no particular longitudinal or latitudinal orientation. Major thoroughfares Pudong Avenue, Zhangyang Road and Yanggao Road run east-west until Yangpu Bridge before turning gradually to become north-south. Century Avenue crosses all three major roads and extends from Lujiazui to Century Park. Yanggao Road extends south to the A20, Shanghai's outer Ring road, which runs east-west from Xupu Bridge and then north-south beginning at the interchange near Renxi Village, when the east-west expressway turns into Yingbin Avenue, headed for Pudong International Airport. Huangpu River at night. “Better City, Better Life” is the theme of Expo 2010. Satellite image of Shanghai's Pudong district. ^ 上海自贸区空间扩大4倍 将与浦东新区合署办公. People's Daily. April 27, 2015. Retrieved April 27, 2015. ^ "Contact Us." Dulwich College Shanghai. Retrieved on October 12, 2013. "DCS MAIN CAMPUS 266 LanAn Rd, JinQiao, PuDong, 201206 地址：上海市浦东金桥蓝桉路266号，201206" and "DUCKS 425 LanAn Rd, Jin Qiao, PuDong 201206 地址：上海市浦东金桥蓝桉路425号，201206"
^ "Home Archived 2014-05-17 at the Wayback Machine." French School of Shanghai. Retrieved on 23 May 2014. "Campus de Pudong : 1555, Jufeng Lu, Pudong District 201208 Shanghai (Chine)"
^ "Kontakte." German School of Shanghai Pudong. Retrieved on 23 May 2014. "DS Shanghai Pudong 1100 Jufeng Lu 201206 Shanghai - VR China" - Chinese address: "上海德国学校浦东校园201206上海市巨峰路1100号综合楼"
^ "Shanghai Japanese School Pudong Campus." Shanghai Japanese School. Retrieved on February 18, 2014. "上海日本人学校　浦東校 〒200127　上海市浦東新区錦康路277号"
^ "Home." SJS Senior High School. Retrieved on February 18, 2014. "〒200127 上海市浦東新区錦康路277号"
^ "Contact Us." Wellington College International Shanghai. Retrieved on September 30, 2015. "Wellington College No. 1500 Yao Long Road (near the Oriental Sports Center) Pudong, Shanghai 200126 上海惠灵顿国际学校 上海市浦东新区 耀龙路1500号 (靠东方体育中心) 邮编：200126"
^ "." THE WALT DISNEY COMPANY REACHES ANOTHER MAJOR MILESTONE ON SHANGHAI THEME PARK PROJECT. Retrieved on July 7, 2010. ^ "Contact Us." Comac. Retrieved on November 10, 2012. "25 Zhangyang Road, Shanghai" - Chinese: "上海市张杨路25号"
^ "Yangtze River Express Airlines Company Limited Archived 2016-05-02 at the Wayback Machine." HNA Group. Retrieved on February 24, 2014. "Address: Pufa Tower, 588 Pudong South Road, Pudong New Area, Shanghai" - Address in Chinese Archived 2014-03-01 at the Wayback Machine: "地址：上海市浦东新区浦东南路588号浦发大厦 邮编：200120"
^ "Mainland Service Network." Hang Seng Bank. Retrieved on 11 September 2011. "Hang Seng Bank（China）Limited Address: 34/F & 36/F, Hang Seng Bank Tower, 1000 Lujiazui Ring Road, Pudong, Shanghai, China"
^ "Office locations." Kroll Inc. Retrieved on 14 August 2011. "Shanghai Room 3031, 30F 1000 Lujiazui Ring Road, Hang Seng Bank Tower Pudong New Area Shanghai 200120 China"
^ "Google locations." Google. Retrieved on May 25, 2016. "Google Shanghai 60F, Shanghai World Financial Center 100 Century Avenue, Pudong New Area Shanghai 200120, China"
^ "Vice Chairman of Shanghai visited Kuopio". Kuopio Innovation. 2013-06-04. Retrieved 2015-12-01. Kris Olds, “Globalizing Shanghai: The ‘Global Intelligence Corps’ and the Building of Pudong," Cities 12, no. 3 (1997) 109-23. Wikimedia Commons has media related to Pudong New Area. Wikivoyage has a travel guide for Pudong.